No question, the best way to experience the Vienna State Opera is at a performance. Only after the curtain rises, the music fills the room and the stage comes to life does a theater truly come into its own. 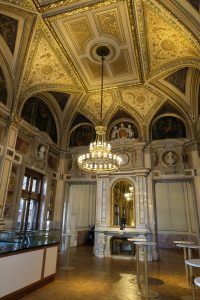 However, it is also exciting to take a look behind the scenes and learn about the history of this internationally important opera house, for instance in a guided tour of the Vienna State Opera. 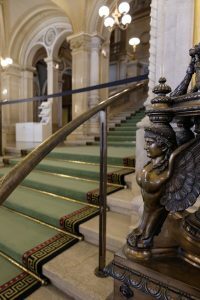 The meeting point for the guided tours is the very impressive foyer, which together with the grand staircase and the Schwind Foyer is still preserved in its original state. The section behind it was hit by a bomb in 1945 and completely destroyed and later reconstructed. The grand staircase leads up to the auditorium. You will notice the carpet is actually green. Only for the Vienna Opera Ball, when the State Opera turns into the most elegant ballroom in the world for a day, is it replaced with a red carpet. The reconstruction left the auditorium no longer as pompous as it was originally in 1869, when the opera house opened with a performance of Mozart’s Don Juan and Emperor Franz Josef and Empress Elisabeth attended the premier. You will immediately notice the small screens in front of every seat. They are part of an information system to provide the audience with information about the piece and the cast before the performance or during the break. During the performance, subtitles can be displayed on the screen in six languages. 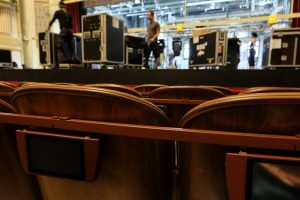 With a bit of luck, you will be able to take a quick peek backstage, which is at least twice as long as the auditorium, also several floors deep and of course equipped with a large amount of technology. The State Opera Orchestra is none other than the Vienna Philharmonic itself. They set the tone in around 350 performances for more than 60 different opera and ballet works. The State Opera exclusively performs opera and ballet. Only in summer, when the house is rented out (e.g. to the Jazzfest Vienna), can alternative sounds also be heard. 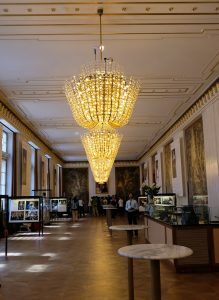 The tour will also take you to the state rooms, such as the Tea Room, which is exclusively rented, the Marble Hall, the Schwind Foyer and the Gustav Mahler Hall, all of which also serve as break rooms. 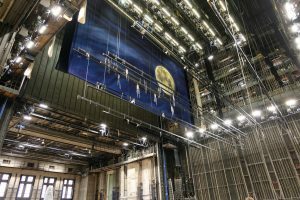 Not only the technical equipment in the Vienna State Opera has kept up with the times, but also new efforts to open the house to the public are constantly being developed. For several years now for example, in April, May, June and September, many opera and ballet performances are broadcast live on a 50 m² video wall in the square in front of the opera house for the public to enjoy for free under the open sky. In addition, performances can also be viewed live on TV from the comfort of your living room or on the road via mobile devices. However, this is a paid service. Every evening, 567 standing room tickets are offered for a mere 3 to 4 euros. These tickets are sold at the standing room ticket booth (Entrance on Operngasse) 80 minutes before the performance begins. These tickets are so popular that sometimes long lines form. That said, you get full enjoyment at little cost. Guided Tour of the Vienna State Opera: When & Where? During the performance season, there are usually two guided tours per day, normally at 2 p.m. and 3 p.m. Click here for the current tour schedule (please note, there are days when there are no guided tours). 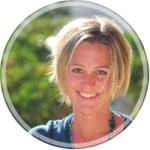 Tours are always in German, English and Spanish. Other languages are possible upon request. Individual visitors do not require a reservation. It is sufficient to be at the meeting point approximately 15 minutes before the tour begins. Tickets for the tour can be purchased at the entrance to the State Opera located on the corner of Operngasse and Opernring. More guided tours are available in July and August, with guided tours every hour between 10:00 a.m. and 4:00 p.m. 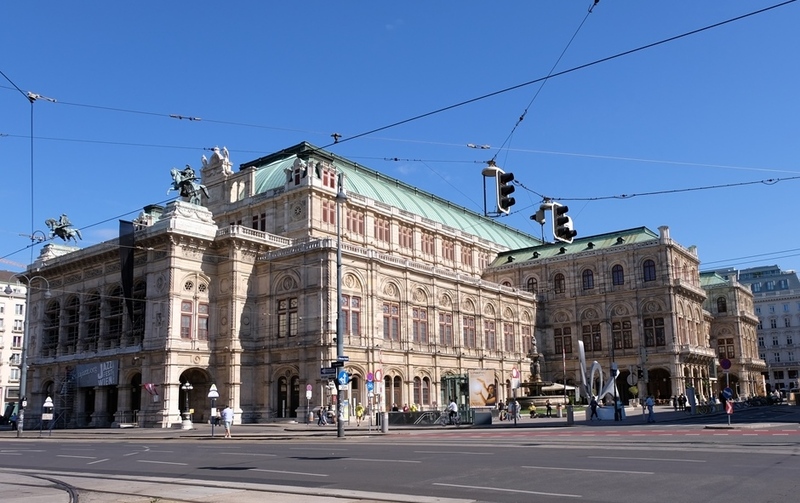 The Vienna State Opera is within walking distance of all five Schick Hotels. Our reception team will be happy to organize tickets for any Vienna State Opera performance you would like to attend. Simply let us know.